Canadian and American negotiators came to agreement on a new North American Free Trade Agreement (NAFTA), or NAFTA 2.0. Chapter 11 between Canada and the U.S. is gone. The investor-state dispute settlement provisions that were in NAFTA 1.0 have allowed U.S. corporations to sue Canada for billions over policies and laws that infringed on corporate profits even if they were done in the public interest. Energy proportionality is also gone, which required Canada to send a set percentage of its energy resources to the U.S. even in times of shortages. In addition to the elimination of these two harmful provisions, Canada was able to retain the cultural exemption clause from NAFTA 1.0. And there are promising signs of improved labour standards too, including increased wages and collective bargaining freedoms for Mexican workers, which the Council of Canadians also strongly advocated for in partnership with labour allies in the U.S. and Mexico. These are major victories for all of us who sounded the alarm on how these dangerous provisions affect our ability to protect the public interest and the environment. A national public education and engagement campaign that reached more than 1 million people that included our hard-hitting TV ad that ran on CBC’s The National, a series of informational videos breaking down key problem areas, and our NAFTA Toolkit that helped ordinary people take the NAFTA fight directly to their own MPs. Mobilizing more than 35,000 people to make individual submissions to the federal government’s public consultations on what they want to see in any new NAFTA deal, including the elimination of both Chapter 11 and energy proportionality. Presenting to the House of Commons Standing Committee on International Trade to bring our collective concerns directly to Parliamentarians. Producing hard-hitting research and timely reports on why energy proportionality should be out of NAFTA, and what was needed to make NAFTA a good deal for people and the planet. Organizing numerous public forums and rallies in communities across Canada to help people better understand what’s at stake and how to get involved. Unfortunately, the news isn’t all good. Our farmers will pay a heavy price as NAFTA 2.0 opens Canada’s market to more U.S. dairy products, including products that contain bovine growth hormone (BGH), a genetically modified hormone that is injected in cows to make them produce more milk. BGH has been banned in Canada due to its link to serious health concerns. There will be increased deregulation and harmonization of rules to accelerateapprovals for massive pipelines to be built. Patents on pharmaceuticals, like biologic drugs, have also been extended, which will mean it will take longer for generic drugs to get to the market. This will keep drug prices higher – and often unaffordable – for longer and could have an impact on Canada’s attempt to implement a national pharmacare plan. You can read even more analysis on the NAFTA 2.0 from the Council’s Trade Campaigner, Sujata Dey, in her blog post from last night. So while there is much to celebrate today, I do so with cautious reflection about what is still to come. 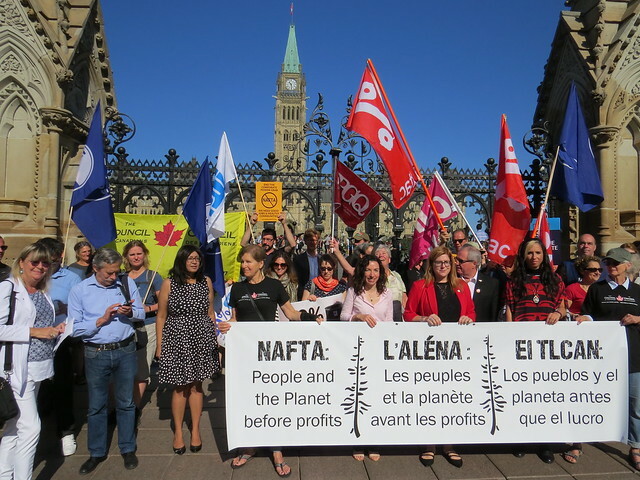 What is also clear is that NAFTA 2.0 – which negotiators refer to as the United States-Mexico-Canada Agreement (USMCA) – is still based on a flawed trade model that protects corporate interests over people and the environment. This new NAFTA deal doesn’t address climate change and it could still leave our water vulnerable to corporate interests that want to buy and sell it. It also does not, as promised, include provisions on gender equality or Indigenous rights. In many ways, I fear NAFTA 2.0 is cut from the same cloth as the Canada-European Union Comprehensive Economic and Trade Agreement (CETA) and the Comprehensive and Progressive Agreement for Trans-Pacific Partnership (CPTPP). And that’s why you and I must remain vigilant and continue to speak out for a new trade model that puts people and the environment first. If there’s one clear positive takeaway with NAFTA 2.0, it’s that we have shown it’s possible for the people of this country to change things that were once thought unchangeable in trade agreements – and that gives us all tremendous hope. You can trust that we will continue to monitor how this new deal unfolds over the coming days and weeks. Our fight is far from over.